Brand new gas range oven igniter replaces Whirlpool, Sears, Kenmore, General Electric, 4342528, WB2X9154. Round style design. 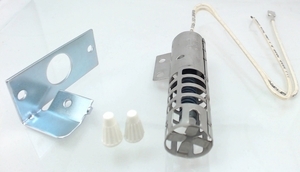 This igniter replaces all round style (Carborundum) oven igniters. Includes two high temp wire nuts. Range: 2.5 to 3.0 amps. Does not replace flat style igniters. Caution: the dark grey coil is very fragile, handle with care. Replaces part numbers:	AP3104565, 300259, 3196447, 321342, 327617, 337263, 337389, 337390, 3422, 4157446, 4322910, 4332948, 4338008, 4338037, 4389493, 8053999, AH360921, EA360921, F16-569, GR403, K16866, PS360921.